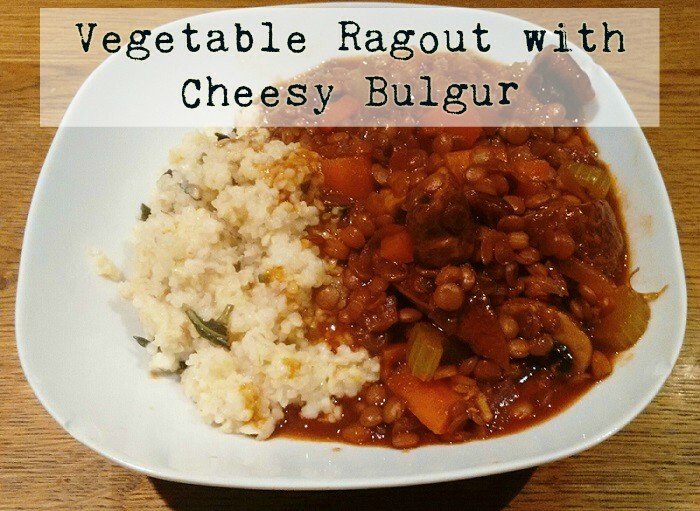 This Vegetable Ragout with Cheesy Bulgur was one of the most tastiest dishes I have tried. Both my husband and I had never really tried bulgur wheat before, so we were pleasantly surprised at the taste. You will often find Bulgur Wheat in our cupboard now as a staple because you can use if for so many things. I highly recommend trying this recipe out and if you don’t really like certain ingredients then adapt it to your tastes. It is one of the most expensive recipes I have tried from the Goustos cookbook, but it was worth every penny. You can make this recipe cheaper depending on the amount you buy and where you shop at. 1. Boil a Kettle. Peel and slice the carrot and celery into bite-size pieces, then peel and slice the onion finely. 2. Heat a large wide-based pan with 2 tbsp vegetable oil over a medium/high heat. When it’s hot add the carrot, celery and onion. Cook covered for 5 minutes until slightly softened. 3. Meanwhile, add the bulgur to a pot of boiled water, add a pinch of salt and cook over a high heat for 10-15 minutes until tender. Re-boil the kettle to use for the stock. 4. Meanwhile, peel and finely chop the garlic Cut the mushrooms into wedges. Then add the garlic and tomato paste to the pan of vegetables and cook for 1 minute. Add the mushrooms to the pan and cook for 2 minutes until they start to soften. 5. Meanwhile, dissolve the stock cube in 300ml boiled water and add it to the pan. Cook for 2-3 minutes or until a sauce forms. 6. Drain the lentils, add them to the pan and cook for the final few minutes. Chop the basil finely, including the stalks, keep the leaves and stalks separate. Grate the cheese. 7. Once cooked, drain and return the cooked bulgur to the pot along with the grated cheese, basil stems, a knob of butter, milk and season with salt and pepper. 8. 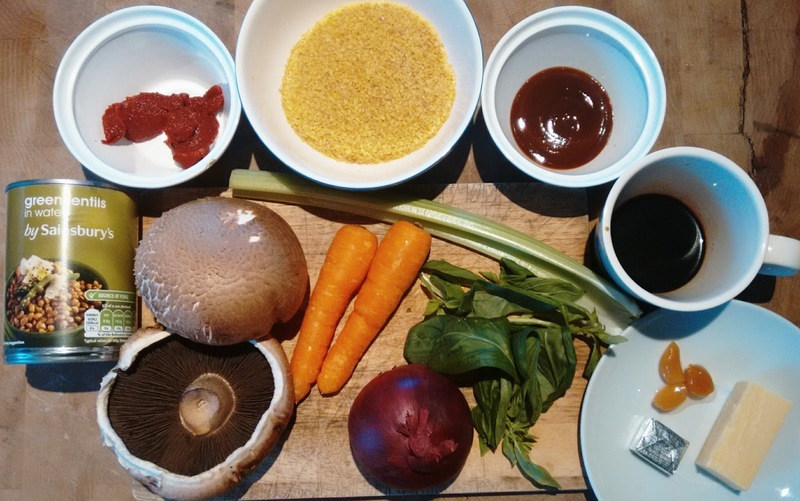 Remove the vegetable ragout from the heat and stir in the relish and brown sauce. Serve it over the cheesy bulgur and garnish with the remaining basil leaves.